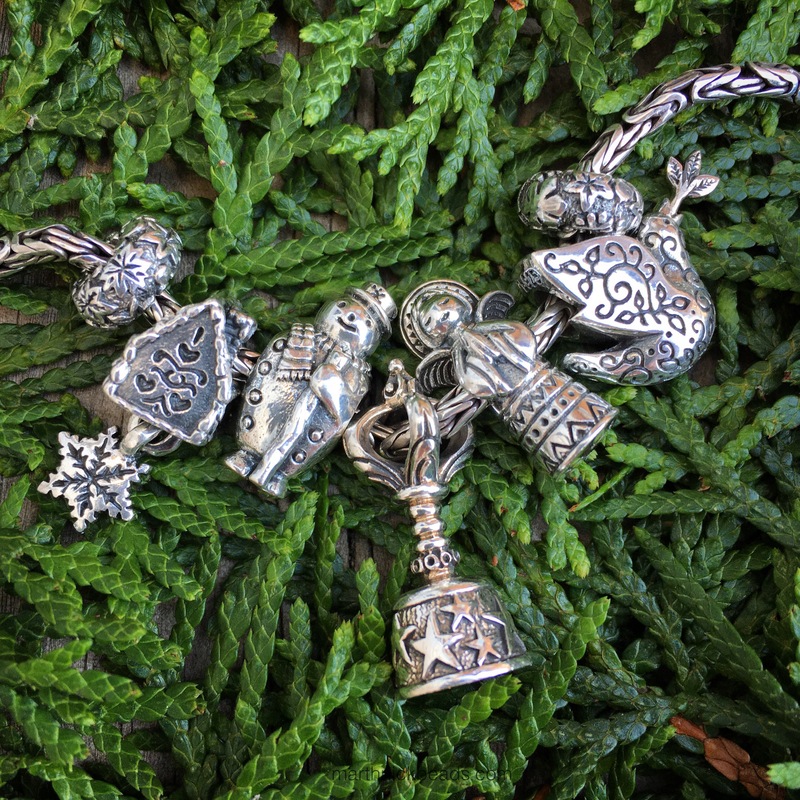 Redbalifrog traditionally makes the most lovely Christmas beads and this year is no exception. The Gingerbread House and Snowflake from a few years ago is my all time favourite Christmas bead. Last year I used it with the Shaman’s Bell. 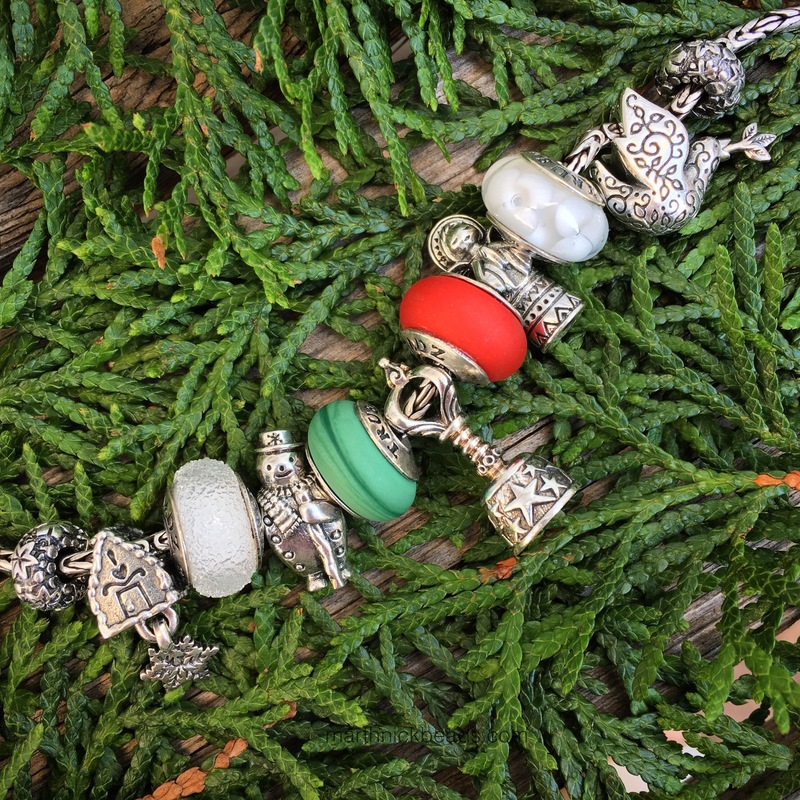 This year there are several new beads in the collection called A Vintage Christmas. What I have here today are the Snowflake stoppers and three new beads. Below left to right are the Gingerbread House and Snowflake, Icy the Snowman, the Shaman’s Bell, Angel Bright and Dove of Peace. They have a large core and fit on Pandora bracelets. The stoppers will fit on a Trollbeads bangle, as shown a few pictures down. Icy the Snowman is adorable. I was hoping it would snow a bit for some photos, but no luck. So I’ve used some white beads in place of it! I love the stick that he’s holding. He reminds me of the Raymond Briggs book called The Snowman. Here’s a view of the back with the detail on the scarf. 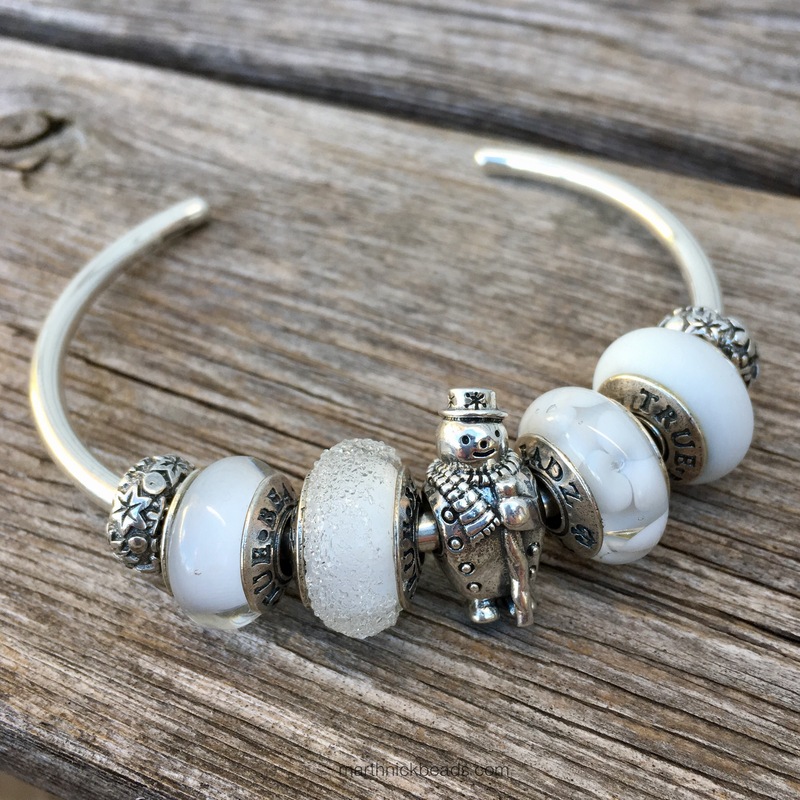 I love him on a bangle with all white beads. Left to right below are True Beadz True Air Siberia, Taste Siberia, Blossom Siberia and Touch Siberia. The stoppers are delightful and I really like how the snowflakes have variety in their patterns. Sometimes I wear a bangle of just stoppers. Redbalifrog makes some really pretty ones and I’ve used the Hawaiian Floral ones on my Trollbeads bangle for years. They are the ones in the middle here. The gold looking ones are made of brass and called Star. I’ll have more pictures of Angel Bright and the Dove of Peace a bit later after we get our Christmas decorations out. I couldn’t resist this macro shot of the dove though. Lastly, I made a small bracelet using all the Redbalifrog Christmas pieces I have and then added in some True Beadz for a pop of colour. The green bead is a True Touch Gooseberry and the red is True Touch Strawberry. I think these are so sweet and it’s nice to have some really traditional Christmas beads available for those who like them. There are also the last three of the 12 Days of Christmas beads. 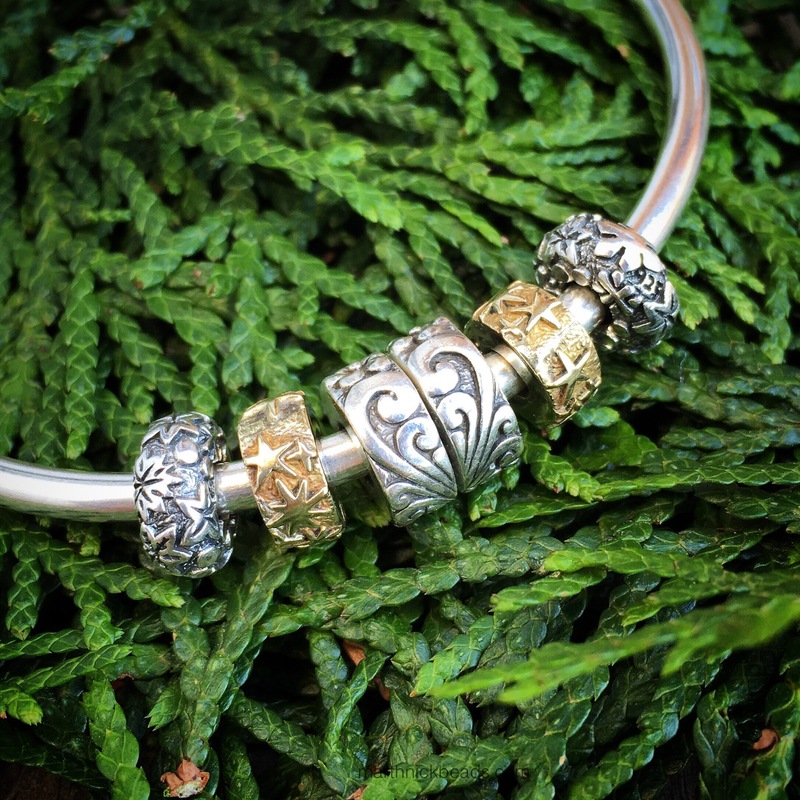 American friends, remember to enter the contest for the Trollbeads Sparkling Bangle! 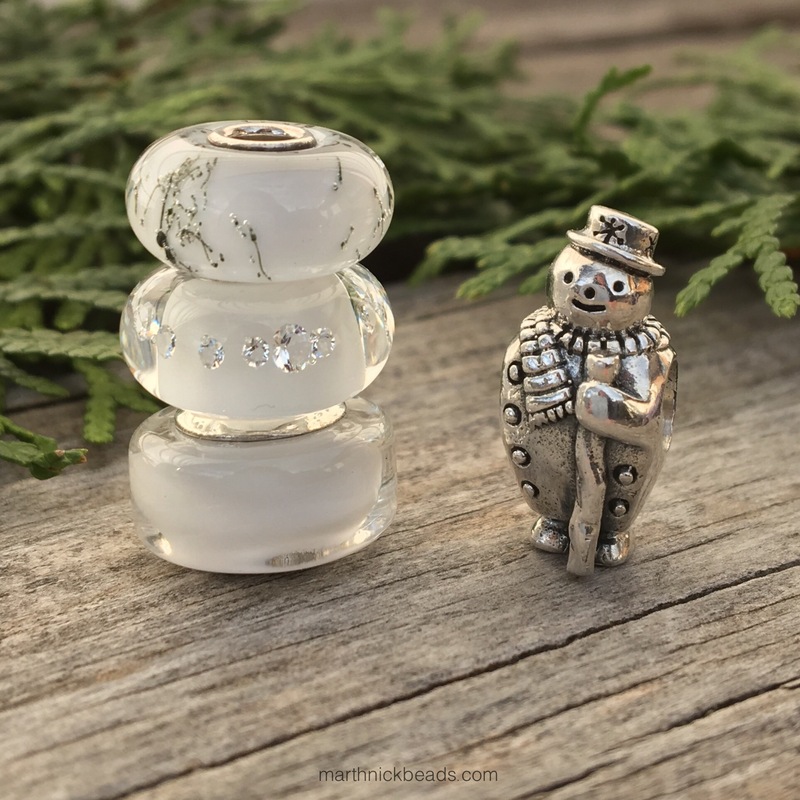 Coming up next week will most likely be Monday- the glass beads from the True Beadz Russian Lullaby Collection, Wednesday- the silver beads and Friday- Daylight Brilliance from Trollbeads. Previous Previous post: Trollbeads Giveaway! Wow, that was quick! The stoppers are so fabulous for winter. Speaking of, it’s going to be 18 here today but then cold with snow on Sunday! This is a really lovely release! The Snowman just has a sweet face and he’ll be on my list. 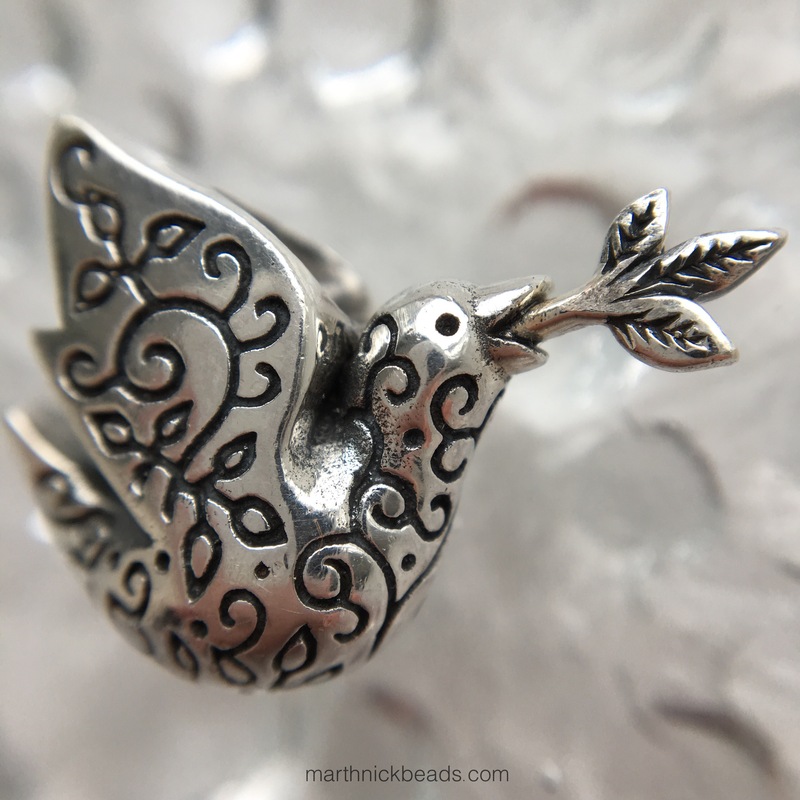 The Dove of Peace is quite pretty, too. And I’ll definitely finish up my Twelve Days of Christmas set. They are such a great set. And I must say that I’m glad Amanda makes us wait to see the release. It’s hard to wait, but I get a kick out of the suspense and the final “big reveal.” It must have been hard to keep a lid on this, but I’m glad you did–much more special this way! It’s always like the night before Christmas with a Redbalifrog release! I really hope you’ll make a bracelet with the complete set of the Twelve Days of Christmas beads and show it on Instagram. I would love to see it! I agree about the Snowman’s smile as he looks very content. Lovely collection from Redbalifrog and lovely review from your side, as always! Could you please tell me the high of Angel Bright? I think it is a little higher than Icy the Snowman…. Hi Serena! She is 2 cm high, about 1-2mm taller than the snowman. 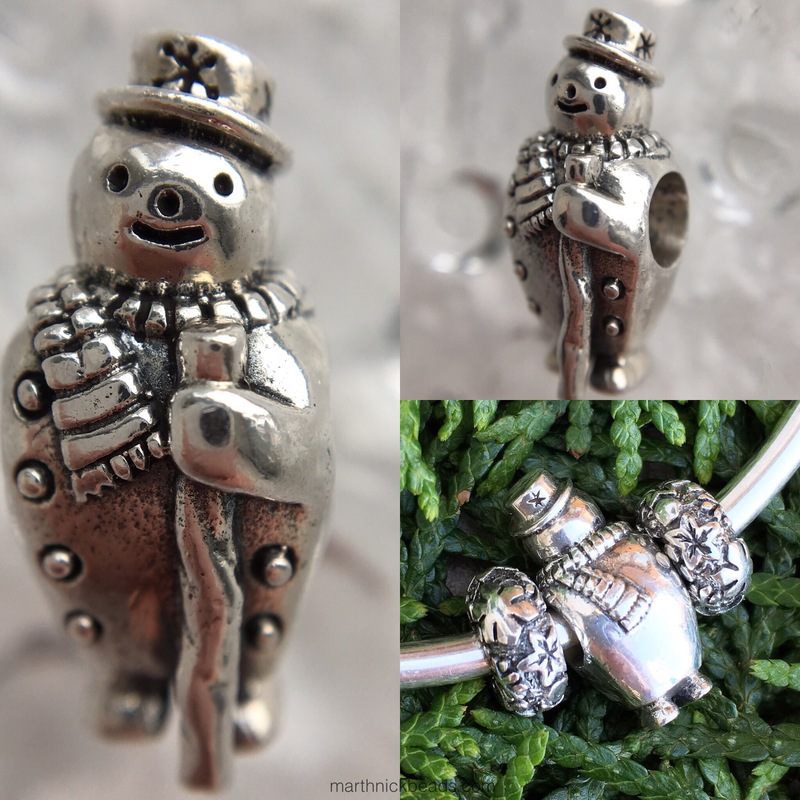 Love the snowman… But oh my those stoppers!!! I don’t have very many anyway, and these would probably work with any winter theme I would think. Yes, they are so sweet and can be used all winter! I’m new to your blog and already with the first one I read your have given me a good idea, to wear Redbalifrog stopperso on the Trollbeads bangle. I have 2 gold tone stoppers, I think Frangipani, they wouldn’t go on the Redbalifrog bracelet, too tight, and I didn’t want to force them. But on the bangle they fit. So thank you! Julia, you are most welcome! 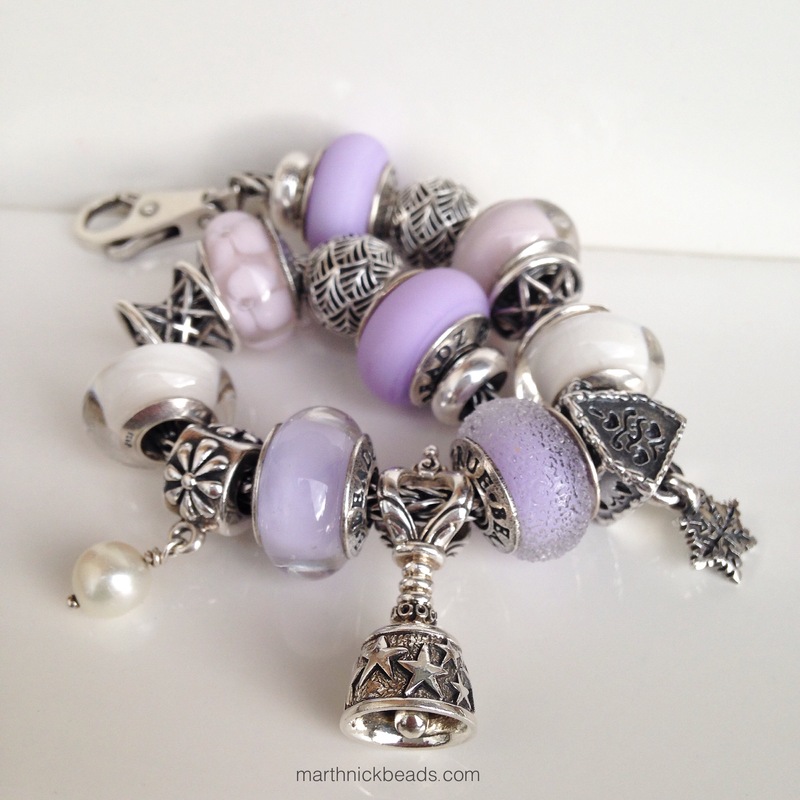 Yes, I wear them on the Trollbeads bangle a lot! This is a lovely collection overall. The snowman is so cute although I feel the dove is my fave from this batch. The thing that surprised me most about my first rBF charms were how massive they were next to the other brands silvers. Makes for a good focal piece if mixing with other brands I believe. And not only the Christmas Wish list but there’s all the Black Friday sales coming up! 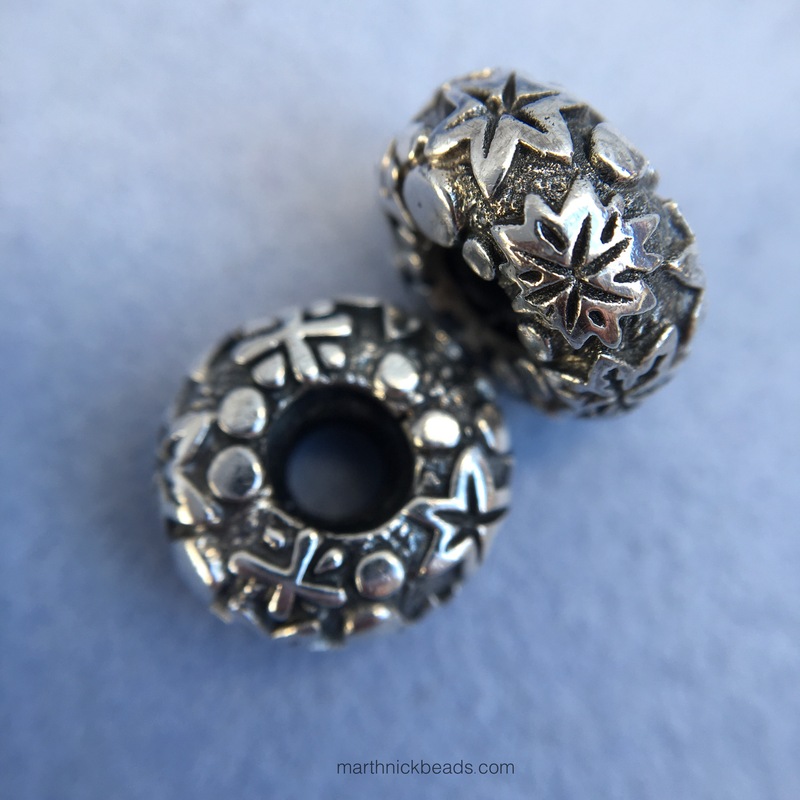 Yes, the Snowflake Stoppers are so perfect for the winter! I need to bring them out again tomorrow while we still have snow!